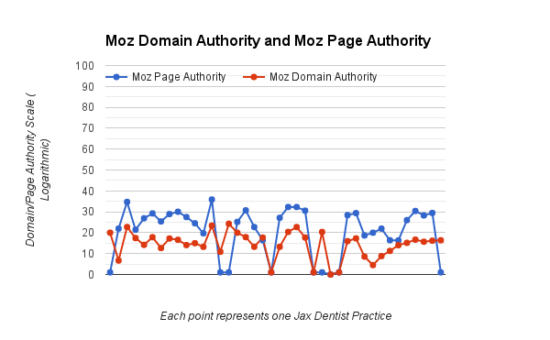 We analyzed numerical data for the top 40 dentists in Jacksonville for the keywords cosmetic dentistry to see how they stack up for our industry-specific SEO case study. The purpose of the study is to see what we can learn from looking at data across an industry in a specific city to see how they compare. In this case that city is Jacksonville, FL because that is where we’re based. This case study is a summary of some of the most important numerical data and a brief explanation of what it all means. As with any case study the data from this are not meant to extend to anywhere beyond Jacksonville dentists and they are not necessarily a representative data set. That said, dentists in other cities will probably have results in the same ballpark. Moz has developed a number of handy numbers for figuring out how likely your webpage or domain is to show up in Google search. Moz is an industry leader in SEO that has put a lot of time and effort into developing these metrics to help people better understand their own online presence and how they look in Google’s eyes. As of 2016 Moz was able to replicate the results of Google with a 70% success rate with their keyword agnostic measures of Page and Domain Authority. We’ll get into the details of those and other metrics as we go. Keyword agnostic just means that they are looking at all relevant search terms for your page and not any individual search term. What all these metrics mean will be explained as we go, so don’t worry if it’s overwhelming now. There’s plenty of pictures along the way! We’ll start with the most specific measures of MozRank Page and MozTrust Page. From there we’ll go to MozRank Domain and MozTrust Domain, then we’ll go to Moz Page Authority and Moz Domain Authority. We’ll end with page load speed and a summary. In this article average refers to mean (not median or mode). MozTrust is a measure of how far your page or domain is from the most trusted sources on the internet such as government or university websites. In this case this measures the MozTrust for just the individual page getting measured. MozRank is a measure of the quantity and quality of the links that link to your page or domain. 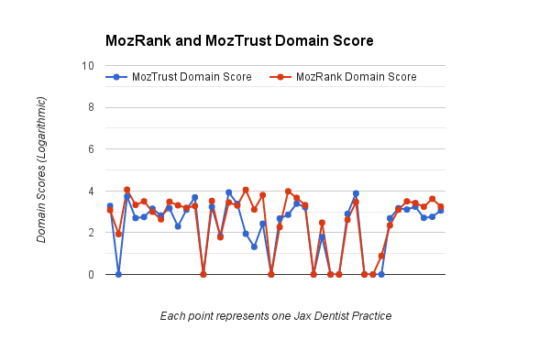 Having a higher mozRank than mozTrust score can indicate use of spammy or low-quality backlinks. If they are low quality links they won’t help your site’s ranking very much, and if they are very spammy links you can actually be penalized for them. So be careful. Backlinks are one of the most important parts of SEO. They indicate that another site thinks your content is useful enough to link to and that they trust your site. That trust and interest is only as valuable as the site it comes from. What to do if my Scores are Bad (below 3)? Any of these practices that have a zero for both MozRank and MozTrust means that they have no incoming links to that page. If that’s you, then get on it. That also means that while they may or may not have had a professional design and create their website, they probably do not have someone doing their online marketing. If they do, they aren’t very good. Getting links is hard, but it is very important. Any online marketer needs to be able to get them. What good is a site if it never shows up in search results? You can use our site auditor tool to find out how many links you have to your website and your MozTrust and MozRank scores (page 7 on the report). Just put in your url and the keyword(s) for that webpage and it will send a 12 page report to your email. If you have 0 backlinks and/or a MozRank/MozTrust score of 0 it’s time to find some new online marketing! If you’re around 3 you’re doing average at best and might still consider it, if you’re at a 5 or a 6 then great job! This graph is meant as a reference and is not how Domain Authority is actually measured. It is much more complicated. All Moz scores are on a logarithmic scale like this, where it takes much more of the same things to increase as the scores get higher. As you can see in the graph it only takes 5 quality backlinks to get from 45 to 50 but takes 50 to get from 80 to 85! These are theoretical numbers and a gross oversimplification of the metric, but it shows how much harder it is to improve the better you get. While the example graph above uses a 0-100 scale it can also be used for 1-10 metrics by simply taking off a 0 on each number on the y (vertical) axis. Anybody who’s site is above a 5 for both metrics is doing great, but above a 4 for both is still good. 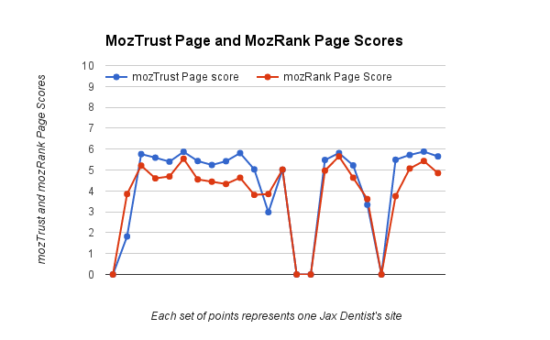 Large discrepancies where MozRank is higher than MozTrust signify a possibility of spammy links. This is demonstrated most notably by the second data point in the MozRank/MozTrust graph that has a MozTrust score of 1.82 and a MozRank score of 3.85. If MozTrust is at a 0 and MozRank is not that could be an indication of spammy links or other practices. It is easier to rank higher for page scores than it is for domain scores, as you will see later. This is because the expectations are much higher for a domain than for an individual page. Most of the pages used in this example happen to be homepages, which will tend to be the highest ranking page of most websites. Page authority and Domain Authority are very similar. Your domain authority is a broad measure of the ‘authority’ of your webpage in it’s field that uses both MozTrust and MozRank among other things to estimate how well your site will rank in various Google searches. Their latest published accuracy as of early 2017 is they are 70% accurate at reproducing Google search results. Basically it’s a really good marker, but still has plenty of room for improvement. One thing to take note of is that Page Authority is almost always going to be higher than Domain Authority. This is because Domain Authority is a significant contributor to the Page Authority score. You’ll see this in the graph. Under .5 seconds = Great Job! .5-1.0 seconds = Good job! 1-1.5 seconds = Not great, but not terrible. Make sure it doesn’t get worse. 3+ seconds = You are definitely losing business and should make this better. Overall we had about half (19) that were under 1.05 seconds, so great job guys! Only 2 were over the 2 second cutoff, but there were 7 that were dangerously close at over 1.75 seconds and below 2. 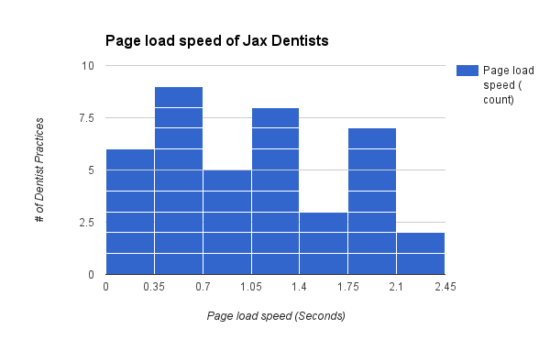 Page load speed is important for both SEO and user experience. The quote above from Kissmetrics shows that 2 to 3 seconds is a danger zone as far as losing web viewers go. There’s two parts to page speed: the size of your website and the quality of your hosting. Make sure to be mindful of your code and the size of your images and other uploaded files. If your site ends up being bogged down from bad practices it can take a lot of tedious work to fix it. The biggest take home message from all of this is that while some dentists certainly have established a sizable advantage over others in the online world, nobody has rankings that are out of this world. Part of that is because it is hard to get a ton of backlinks as a local dentist because not many people are going to care about your page or your practice beyond your locality. That’s also part of the beauty of it as well. Local Google results are becoming all the more important as time goes on, and most dentists don’t care about ranking outside of their local area. They want people that want to come into their office, not just look at their website. While certain highly targeted keywords might be out of reach, that doesn’t mean hope is lost. Every practice can get the most out of their online presence by making a well-rounded online presence that targets numerous different keywords. And get as good of quality backlinks as you can. Ranking highly in Google or even Google’s local results takes really having all your ducks in a row and that takes time. Even if you do an SEO overhaul it is still necessary to continually publish quality new content to stay relevant. If that’s too much for you that’s what companies like us are for– Contact us below! If you’re curious about your scores for the metrics analyzed here you can use our free site auditor tool!